The Museum of Modern and Contemporary Art (MMCA) in Seoul will open a rare farmer’s market Sunday as part of its existing exhibition on urban gastronomy. “Marche@MMCA,” one of several participatory programs associated with “Activating the City: Urban Gastronomy,” which opened on Dec. 5 and runs through March 19, is expected to fill the museum’s spacious front yard with fresh produce, seasonal foods made on the spot by chefs and handcrafted goods by local artists. Local farmers will have talk sessions with visitors to explain the health benefits of their produce and the process of how it arrives at the table of city dwellers, the museum said. 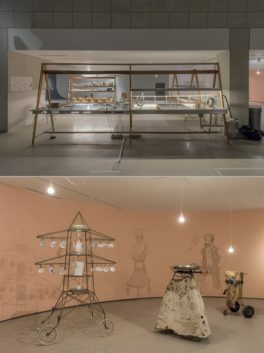 The “Urban Gastronomy” exhibition takes a look at the relations between contemporary art making and urban life through the lens of gastronomy, while casting a delightful light on the meaning of food itself as a primal part of communal culture. Comprised of three parts — “Food x Urban Mobility,” “Food x Community,” and “Food x Sharing Culture” — the exhibit invites 13 teams of artists, activists, chefs, designers and architects to touch upon the subject in videos, audio, installations, graphics and photography.